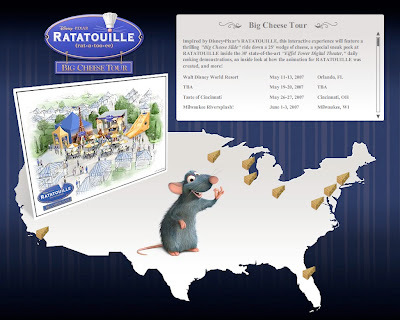 During my daily visit to the Official Ratatouille Website, I noticed they have added information about the Big Cheese Tour that will be visiting cities around the US (and possibly even Paris). As you can see in the picture above, it highlights the locations and there is even a mockup sketch of the attraction. It also mentions there will be a state-of-the-art 30’ Eiffel Tower Digital Theatre. The Tour begins May 11 at the Walt Disney World Resort in Orlando, FL. Find out if it is visiting your city here. P.S. If there is anyone in Orlando going to it (or in any other location), if you take your camera and would like to share your photos, please email me as I am sure everyone who isn’t able to attend would love to see it. Anyone have any idea where in the Walt Disney World resort this will be? AKA: Will we have to pay to get into a park to see it? If not I may try to make a run up there this weekend.